Fitz alum Sarah Winckless is to be Team England Chef de Mission for the 2018 Commonwealth Games and 2017 Commonwealth Youth Games. Winckless (NatSci 1993) is a former rower, won a bronze medal in double sculls with her partner Elise Laverick at the 2004 Athens Olympic Games, and was twice world champion - in 2005 and 2006. 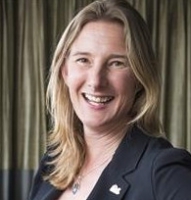 She has previously held the position of UK Chef de Mission for the Youth Olympic Games and served as the inaugural Chairman of the BOA’s Athletes Commission. She was the first woman to be appointed as a Boat Race umpire and in 2015 she was awarded an MBE in The Queen's Birthday Honours for ‘services to sport and young people’.